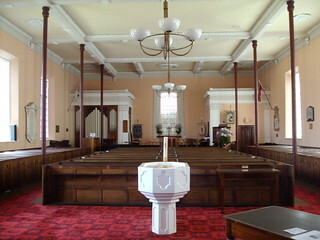 Interior of St George's Anglican church Battery Point Hobart. Opened in 1838. Battery Point, Arthurs Circus, and the Lena House Hotel. Originally guns guarded the harbour from the point, hence the name Battery. Wealthy merchants chose to live there by the 1850s with Alexander McGregor being a good example. He arrived in Hobart from Scotland in 1831.He built up a large whaling fleet and bought Lenna House site from a ship’s captain once he was wealthy. He built this grand house around 1860 with a roof top tower for watching his sailing ships come up the Derwent estuary. It is now a fine hotel, so you can walk in side and look around. Despite two marriages he had no children. Opposite the Lenna is a fine example of a wooden fancy gabled Tudor Gothic style house in Runnymede Street. At the top of Runnymede St is Arthur’s Circus- named after the Governor with its quaint cottages and large horse Chesnuts in the middle of the circus. Is this really Australia? Although in England by the time of its development, Arthur owned this land at Battery Point and sold it off for housing in 1847. The blocks around the circus were all narrow frontage, suitable for workers’ cottages. The cottages were all built around 1850. Battery Point was home to master mariners, shipwrights, seamen, fishermen, shipping agents shipbuilders and as wealthy merchants. The story of St George’s begins in 1836 with services commencing in 1838. The church was consecrated by Bishop W. G. Broughton, the first and only Bishop of Australia. St George's was designed in the Neo-Classical style then current in London. The only other examples of this style of church left in Australia are one in Richmond and one in Sydney. The Government architect, John Lee Archer, designed the body of the building; the tower and porch were designed by convict architect, James Blackburn. The church has an unusual layout, with two side aisles instead of a single central aisle. It still has its original cedar box pews. The Government agreed to grant convict labour, stone and timber for the church tower. Lime, lead and glass had to be provided by the church members. By 1847 the tower was finally completed, but the porch and the rooms at the basement of the tower were left unfinished. St George’s porch was not added until 1888. The stone for its fine fluted Grecian columns was quarried at Bellerive. James Blackburn (1803–1854), was a civil engineer, surveyor and architect who had been transported for forgery in 1833. He was pardoned in 1841, but continued in private practice as an architect until 1849. His work included: St Mark's Anglican Church at Pontville (Romanesque), the Lady Franklin Museum (Grecian) and The Grange at Campbell Town (Tudor).